This is a list of pre-release and unused content for the game Super Mario 64 DS. The game's working title was Super Mario 64x4. Screenshots of this build show elements such as an unused background, all four characters fighting Bowser at the same time (implying cooperative multiplayer), and all four characters flying. A demo of the build was playable at E3 2004. One notable difference from the final game is that the courses were not accessible through the hub world (Princess Peach's Castle and the castle grounds). Instead, the player would have to choose a course from an additional menu on the touch screen (which never made it into the final game), which would show the painting of that course (e.g Jolly Roger Bay appeared as a sunken ship.). The multiplayer menu appeared when the Nintendo DS was turned on; this screen also showed the four playable characters. Additionally, the frame rate of the demo was higher than the final version at 60 frames per second. Previews of this build also mention that in single player, the player could switch between all 4 characters using the touch screen, in contrast to the more limited transformation system of the final game. At E3 2004, there was also a demo called Mario's Face where the user could use the stylus to manipulate Mario or Wario's face, and make it 3D or outlined like a cartoon. This could have been an early version of Mario's Face in Super Mario 64 DS. Also, early screenshots depicted Wario with his original long shirt sleeves before adopting the current shorter ones for the final product. An image of an older version of the Bob-omb Battlefield shows lower-quality versions of textures from the original Super Mario 64, instead of the redone textures in the final game; of note, one of the rocks appears green on the map, using a texture from the final Bowser battle, as it did in the original. The E3 2004 demo of Super Mario 64x4. Early NA box art for Super Mario 64 DS. An early appearance of the Red Coin. All four playable characters fighting Bowser. Like the image above. Also, the status bar has a different design, and is on the touch screen. The HUD is not displayed during this scene in the final game. The four playable characters are running. The castle has Goombas surrounding it. Another image of the castle with Goombas surrounding it. The four characters in a tree. The overhead map shows a different layout of the castle grounds. The four characters fighting the Chain Chomp in Bob-omb Battlefield. Note the much different textures, resembling the original's, and the dark green rock on the map. Early Whomp's Fortress. Wario's touch screen location icon is different than the final. Fully functional red Koopa Troopas can be found in the game's code. Unlike green Koopas, when red Koopas see the heroes they will run into them and knock them around (similar to what Bullies do). When they get knocked out of their shells, they don't panic and only walk back to their shells slowly. When the player hits a red shell it slides along the ground, killing foes in its path until the shell hits a wall and breaks. If the shell hits a player, it will take off one piece off the power meter. When Yoshi eats a red Koopa, he can spew fire like in Super Mario World. If one uses cheat codes or a glitch to get through the mirror to play as Yoshi In the Chief Chilly boss battle, the boss will give the following speech: "Hmm? I see you have no mustache. Poor, bald, little creature. It's not a fair fight for you, but luckily, I'm not a fair fighter. Let's go!" and if Yoshi beats him he says "I simply cannot believe that I lost to a hairless pip-squeak like you! My mustache was my only joy. Now what am I going to do?" The caps the player uses were originally enclosed in boxes labeled M, L, and W. The boxes can still be found in a test level still in the game. Super Mario 64 DS only has one ? Switch instead of the separate ! Switches to activate the Wing Cap, Metal Cap and Vanish Cap. However, in the game's data, there are unused message slots indicating the original switches were meant to be in the game at some point, and the switch used in game has the file name 'hatana_red_switch', implying switches of other colors may have planned earlier in development. Via hacking, players have found the room containing the Princess Peach's secret slide level from the original game, which is still in the castle's model, and aside from a lack of collision data and corrupt textures, it's a near exact replica. The warp to the secret slide is still intact as well. The unused red Koopa Troopa graphics, accessed using an Action Replay "play as" code. A Debug Screen exists within Super Mario 64 DS and New Super Mario Bros.. It is also similar to the debug screen in Paper Mario for when the game attempts to manage an invalid function (e.g. from the Herringway glitch). This screen can only be accessed through hacking, or when the player enters the combination of buttons - + + + , let go, + , let go, + after the game freezes. This screen cannot be accessed if the player simply removes the game cartridge. 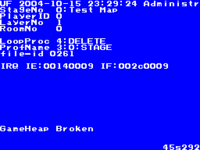 Doing so will freeze the entire game, whilst if the player freezes the game through the use of for example, excess use of the multiple hat glitch, the game will display a blue screen which documents current in-game processes such as the player's location. 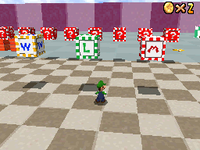 Unlike the older debug menu in the original Super Mario 64 however, the player cannot alter any in-game processes this way. ↑ YouTube - Super Mario 64 DS Action Replay Fun! ↑ What Happened to THESE in Super Mario 64 DS? - YouTube. Retrieved 15 May 2018. This page was last edited on March 10, 2019, at 07:12.